Can You Eat Nutmeg If You Are Allergic to Nuts? Mold is a common form of food spoilage, but just because your food is moldy does not mean it has gone rotten. Moldy nuts can be saved from the garbage can, especially if you catch the mold early or the nut has a protective shell. Remove mold from nuts, but avoid using a harsh, possible poisonous cleanser on food you later intend to eat. Inspect the nuts one by one. Any nut that has gone rotten as well as moldy is beyond saving and should be discarded. Pour white vinegar into a bowl. Do not dilute the vinegar. Put the moldy nuts in the bowl of vinegar. Vinegar is effective at killing more than 80 percent of molds, and also is non-toxic. Soak the nuts in the vinegar for 3 to 5 minutes. Remove the nuts from the bowl, rinse them off and inspect them again. Some nuts may be too impregnated with mold to be cleaned. Discard these too-moldy nuts. 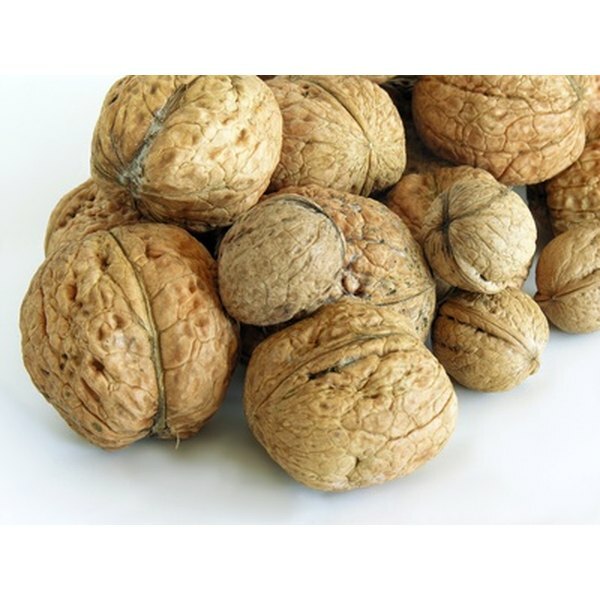 If a nut with a shell retains some mold, crack the shell and check the nut meat before discarding it. Set the remaining, clean nuts in the sun. Sunlight also breaks down molds, and dries your nuts after the vinegar wash.